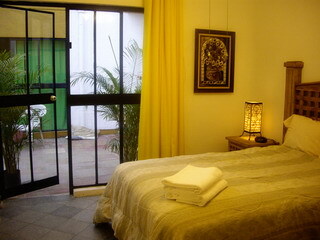 We have three rooms in Guadalajara available in the historical zone of a 5-bedroom house. By the month ($300US), week ($150US) or day ($50 includes continental breakfast and maid service). Relax and be close to sites, events, restaurants, clubs, stores, bakeries, all of the conveniences of living in downtown Guadalajara. The house is also located three blocks from the IMAC Language School, for those wishing to learn Spanish during their stay. The rooms are bright and sunny and include: a double bed, dresser, ceiling fan, lockable closet, wireless internet, TV with DVD player, refrigerator and direct access to either the interior patio or breakfast room. They have a shared bath. Also available for your use in the house is: a washer/dryer, TV with satellite, kitchen, dining and living room, breakfast room, gym area, a DVD and CD library and interior patio. Additional services are also available at an additional charge such as room service or continental breakfast. Meal plans are also available. Besides our guests, the house is occupied by two gay males and a 17-year old male cat. Please contact us at sales AT escapeguadalajara.com for more information and availability. Hi! 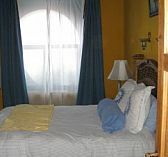 I am interested in perhaps renting a room for 2 people (single bed) for up to 3 months. I am a 30 year old American woman visiting my boyfriend and we'd love to have our own space! Kindly contact me at Looking forward to hearing from you! Join in and write your own page! It's easy to do. How? Simply click here to return to Guadalajara Apartments & Homes for Rent.